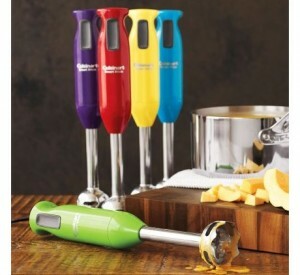 One of my all time favorite kitchen gadgets, the Cuisinart Immersion Blender is on sale at Amazon today for $29 (regularly $55)! These are great for pureeing hot soups or sauces right in the pan without having to transfer them to a big blender (much safer). You can even make shakes, smoothies, baby food and lots of other things with this bad boy! I love that it’s small and clean up is super simple: it’s dishwasher safe. Plus, they ship free! Heads up: the White Model is priced at $29 or you can pay an extra 95¢ and get a fun color!